Experience the life-changing impact of the outback as you camp in the wilderness and learn about ancient Aboriginal culture. Absorb the beauty and wisdom of sites such as Uluru, Katherine Gorge and Kakadu National Park, witness an opal cutting at Cooper Pedy and lose yourself among sandstone cliffs and natural rock pools at Kings Canyon. Students can also opt to participate in the Aboriginal Dreamtime and Bushtucker Tour where they can interact with members of the Walpiri tribe. Getting there… Take your pick! We offer flexible travel options to and from the Northern Territory. If you have a set duration we can tailor a Northern Territory tour to meet your needs and time-frame. Coober Pedy Enjoy a tour of the town Coober Pedy, famous for its opals and underground population. Opal Cutting and Polishing Demonstration Later visit an underground home and mine and witness an opal cutting and polishing demonstration. On the move Enjoy the famous Breakaway Reserve while en route to Uluru. Uluru-Kata Tjuta Cultural Centre Embark on a self-guided tour of the Uluru-Kata Tjuta Cultural Centre. 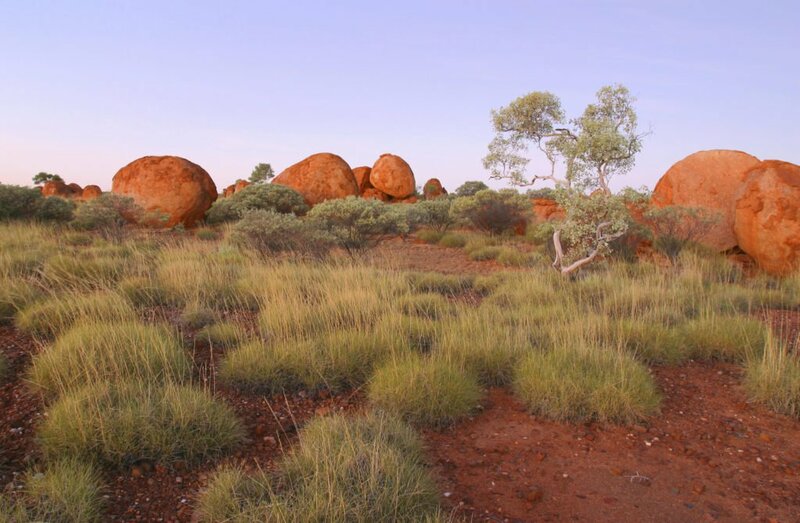 Learn about the local Anangu culture and the spiritual meanings of the surrounding landscapes. Sunset Strip Witness the sunset over Uluru from the Sunset Strip. Uluru Take a circular tour of Uluru's base and view the aboriginal sacred sites and caves. Kata Tjuta Finish with a visit to Kata Tjuta, another scenic wonder of the Red Centre. Breakfast Afterwards, depart for Alice Springs. Arrive in Alice Springs Enjoy a city sights tour with visits to the Royal Flying Doctor’s Base, the School of the Air and Anzac Hill. Devils Marbles Also known as Karlu Karlu, this location is an enigmatic place of breathtaking scenic beauty, the precarious piles of huge granite boulders wide open skies and golden sunlight make here an unforgettable place to visit. Daly Waters Arrive in Daly Waters and set up for overnight camping. Mataranka Thermal Springs Bathe in the famous Mataranka Thermal Springs, in the heart of the “never never”country. Katherine Gorge National Park Enjoy dinner before camping overnight. Katherine Gorge Cruise along the stunning natural Gorges in Katherine before heading to Kakadu National Park. Jabiru Tour the town of Jabiru before watching the sunset at Ubirr Rock. Kakadu National Park Enjoy a sunrise cruise along the Yellow Waters Lagoon where you will see the abundant wildlife - majestic Jabiru Storks, Mudskippers and Rainbow birds. Keep an eye out for the salt water crocodiles! Jabiru Visit a ranger station and Nourlangie Rock. Litchfield National Park Discover waterfalls, rock pools and magnetic termite mounds in Litchfield National Park. Enjoy lunch and a swim at Wangi and Florence Falls. On the move Head to Darwin for overnight camping. Breakfast After breakfast, pack up camp. Museum and Art Gallery of the Northern Territory Discover the history and culture of the Northern Territory at the Museum and Art Gallery of the Northern Territory. Mindil Beach Sunset Markets Enjoy some free time to shop for souvenirs. Dinner Enjoy your last dinner before watching a new release movie at the Casuarina Cinemas. Optional activity - Darwin Military Museum Be captivated by the audio-visual journey of Darwin's Defense Force. Departure Bid farewell to Darwin and begin your journey home. Thank you for your interest in our WorldStrides Northern Territory Safari Tour! Please tell us a little more about yourself so we can get you sent to the right place.